The Black Widow is particularly lame in this movie as a superhero. One would not even know why she is considered anywhere near the level of the other super heroes at any point. Not one super power is explicitly indicated, explained or alluded to. Just the idea that she can read people so super duper well. Really?!? This is her “superpower”? She was a Russian spy who got her memory erased multiple times by the KGB so that they could make her into anyone at anytime. A little bit Dollhouse. She can process multiple information streams very quickly. SHE IS RUSSIAN. Shouldn’t a Russian accent be the default here? Seems she should have been more integral to the planning and forwarding of the plot. Could she have been more vocal during the little boys fight going on upstairs or is it only the men who question things that are going on. It seems since she can process multiple streams of information, she could have been integral to that part of the plot. Or in the chase or running away from the Hulk since he wasn’t specifically chasing her, she could have been shown to have faster reaction time. She could have heard something a few seconds earlier than someone else. Oh, and how about some cinematic technique to show her fast reaction time? By the way, I almost hate to write this because I love Joss Whedon. 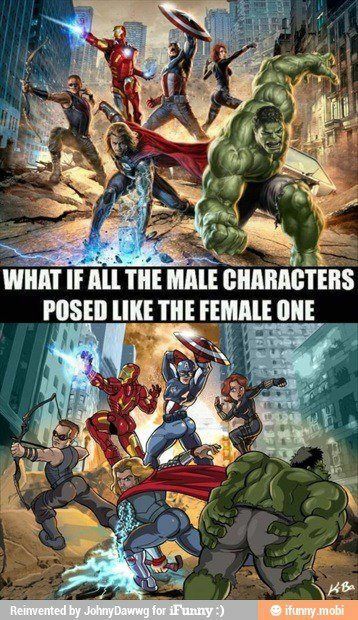 He’s given us some super awesome female characters. Yet in this movie, I was sorely disappointed. Therefore this is no allegiance to the original or some incarnation of the original Avengers as some people have been quick to suggest to me. This movie did not stick to the original stories in every situation. In any case we really are only bound after all to what we allow ourselves to be bound by. On race, I will note the lack of black superheroes. There is Nick Fury. The lone black character among how many roles offered up in this movie? Where are the Asian people? Hispanic? Oh yeah, and geek fandom, I welcome the likely corrections to any minutiae I may have gotten wrong. Jump in. However rude or rudely sexist comments will be deleted.